Manny Muhammad "I'm Destined For Big Things"
Former American Basketball Star Returns To York Hall in London, The Scene Of His Sensational Debut Victory Over Undefeated Opponent In March. 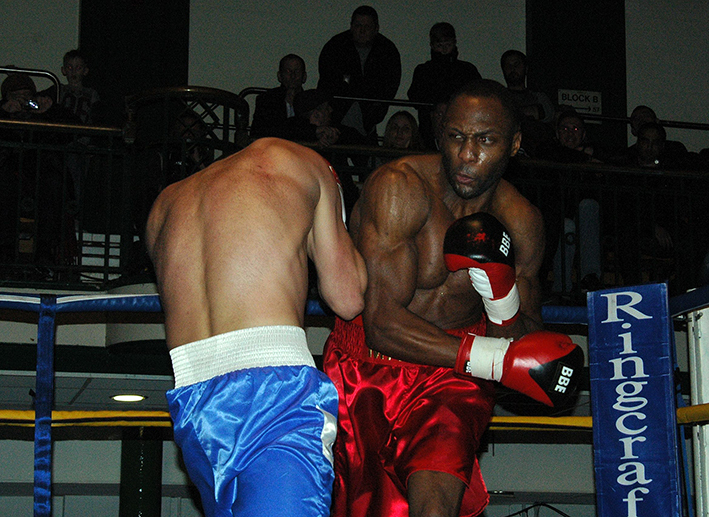 Back in March former Pro Basketballer Manny Muhammad made the highly successful transition from hoop to ring, when he secured a points victory, over Lithuania’s Vaidas Balciauskas, on his debut at York Hall in London. Whilst it is not unusual that a debutant wins his first fight, Manny and his team wanted to make a statement, so instead of going the normal route of a nice easy fight against a seasoned journeyman to get the ball rolling, the Floridian chose instead to take on a undefeated, in three, opponent. A bold move indeed, one which Manny seemed more than happy to do, both prior to and post the bout, as not only did he come away with a nice maiden victory, but rocketed up the rankings to 107 (from 210) in the USA and more incredibly hit the World rankings at 509 (from 986) in the Super Middleweight division. Now the London based American is back in the gym preparing for his second fight, which takes place on the undercard of the highly anticipated George Hillyard vs. Kirill Psonko rematch, on the Dave Murphy Acourtier Events promoted JUDGEMENT DAY show at the York Hall, Bethnal Green, London on Saturday May 31st. Following a training session at the TRAD TKO Boxing Gym in Canning Town the amiable American took a little time to talk about his maiden victory and his upcoming bout. “I’m feeling pretty good you know, Barry (coach Barry Smith) is getting me in shape, as always the TRAD TKO boys are ready to fight, you know I keep saying this is the best gym in the UK, it is, you see it every day how hard we work. I’m ready now, I just can’t wait to get back into the ring and do my thing. It was a really good show last time out, credit to Dave Murphy and Rio (Malta Boxing Commission VP Gianluca Di Caro), who are always working tirelessly to make these shows happen. It was a very good win for me, I said this all the time, if you prepare properly and give it a hundred percent, you know good things will happen and that’s just what I did and I got a good win over a previously undefeated guy. I listened to my coaches, kept him off with the jab and got the job done, as I said he was an undefeated guy which is the kind of guys I want to fight, I believe I am destined for big things, hopefully there is more to come. I’m really trying to bring a big crowd with me this time around, I want a packed house and I’m the kind of fighter does well under pressure, when the stakes are high and the lights are bright I come to shine, so hopefully we can get a large crowd, as I can guarantee I’m going to be putting on one helluva performance. To the boxing fans out there, come and see a really good show on May 31st guys, come support the fighters, come support the Lean Team’s Manny Muhammad, TRAD TKO and the Malta Boxing Commission.